Nose: A fresh winter fruit salad of mixed apples, pears, and grapes, with a side serving of milk arrowroot biscuits and some subtle sweet spices. Palate: The winter fruit and malty biscuits come through from the nose, now joined by citrus zests – more lemon and lime than orange. Also joining the nose is a decent serve of hops – soft and sweet, but with a slight tang; even a touch floral perhaps. A hint of vanilla also creeps into the palate. Mouthfeel: Not the thickest whisky I’ve ever had, but a decent heft is present nonetheless. A touch creamy as it coats the tongue. Finish: There’s a decent length to the finish – still quite fruity, although more green apples than red apples or pear now. Still a touch of citrus zest though, and a lingering hoppy tang. The finish isn’t heavy by any means, but it does last. A no-age-statement single malt from Glenfiddich that has been bottled at 46% ABV after being finished in casks that previously held IPA beer that was specifically brewed for Glenfiddich by the Speyside Craft Brewery. The whisky was originally aged in ex-Bourbon barrels. This is definitely a young whisky, younger on average than the casks that go into Glenfidich’s standard 12 year old, but that works well with the IPA finishing – which works well with the vibrant young Glenfiddich malt. An experimental whisky that required as much effort to get right as this IPA release is not something you generally expect from a distillery or brand as large and as old as Glenfiddich – a distillery that could almost be forgiven for resting on its laurels; after all it is the best selling single malt Scotch. Fortunately for us, Glenfiddich is owned (as it has been since it was founded) by William Grant & Sons – Britain’s largest family-owned whisky company, and one that is led by the fifth generation of the founding family. I say fortunately because family businesses are often looking for that extra edge, and are more ready to take risks that boards have trouble presenting to shareholders in public companies – and the amount of effort that went into the trial and error and every stage of designing this whisky was not small. 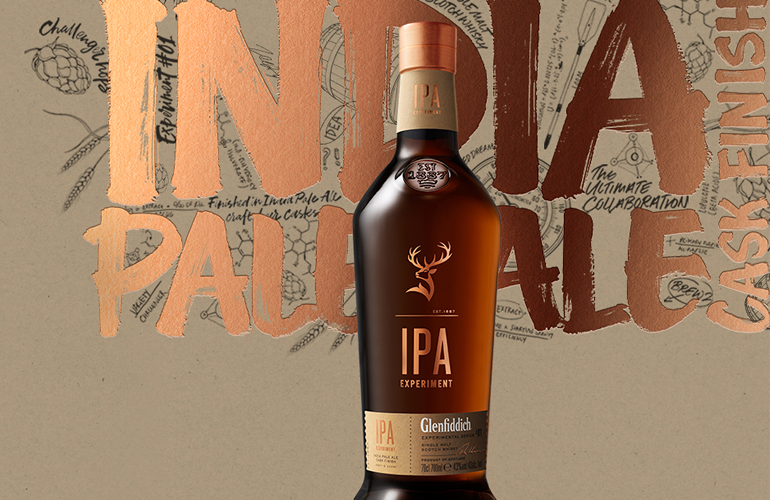 Glenfiddich’s malt master, Brian Kinsman, and Speyside Craft Brewery’s founder, Seb Jones, tried different hops in their IPA recipe, beers casked at varying alcoholic strengths, and varying the amount of time the whisky was finished in those casks. The resulting whisky is a crisp, light, fruity whisky, with a citrus edge, and a biscuity, hoppy, base. It’s still very Glenfiddich, yet something noticeably different from their other expressions. This isn’t a whisky that will blow your socks off, but it’s also not a bland whisky by any means – it has plentifully vibrant character. If it wasn’t for the fact that it currently costs north of twice a bottle of the Glenfiddich 12yo, this is a whisky that you could easily kill a bottle of without thinking about it, and still want more. If you haven’t tried this whisky, definitely get yourself a bottle, or at least buy yourself a serve at your favourite bar.